Happy Friday Angelenos! Looking for things to do in L.A.? 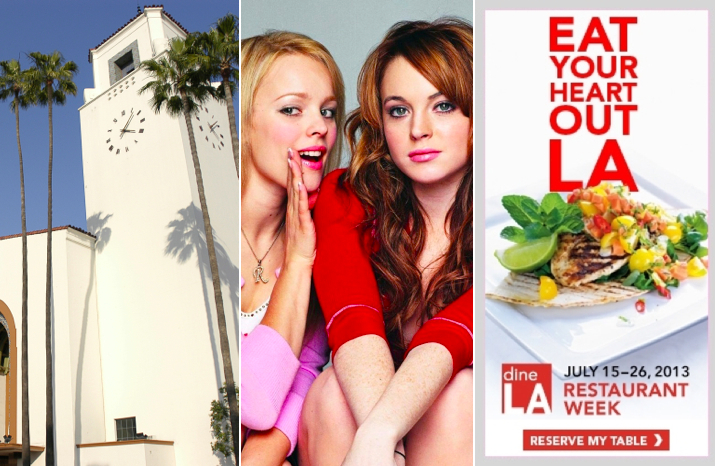 This weekend check out the quintessential L.A. food/wine festival, relive high school and soak in the last few days of dineLA! Tonight, contribute to a great cause at the East LA Meets Napa food and wine festival in DTLA. Held at beautiful Union Station, 30 L.A. restaurants and wine stations will be on hand to guide you to the perfect pairing. While tickets are pricey ($150 and up), having unlimited Lotería! Grill mole tacos and Porto’s might just be worth it. Saturday, watch the cult classic and a personal fave, Mean Girls at Street Food Cinema. Be ready to recite your favorite lines, beamed from a jumbo screen to a giddy audience. Doors and food trucks open at 5:30. Tickets are $10-15. And, while it’s not Wednesday, wear pink. Lastly, put down that leftover Chinese takeout and keep the Freschetta on ice! You only have a few more days to enjoy the glory that is dineLA! Savor special 3-course menus from some of L.A.’s top eateries. Prices are $15-$25 for lunch and $25-$45 for dinner. Have a great weekend!